Aruberusan - Business and technology strategy, emerging and traditional markets, competition and crisis management. If you did not yet read the article “Why Scrum Should Basically Just Die In A Fire” by Giles Bowkett, you should. That is a great discussion of various key points in Scrum methodology and the shortcomings in nearly all of its implementations in real world. I have been meaning to write up a bit of my own criticism of Agile and Scrum the way it is usually implemented today but this guy pretty much nails it down. I don’t know personally the guys who actually put together the first definition of Agile, but I think they did not mean it to be the spectacular failure it is in too many companies today. They certainly meant to concentrate on getting working software faster and with less distraction from endless meetings that bogged down software development in the nineties. They did not mean to make management lose the long-term perspective and focus on the immediate short-term “productivity” at all times. I hear often comparison of IT and computing in the cloud with other “commodities”. Some people say, well, we do get the water and electricity centrally, why would we not get the computing centrally as well? There could be suppliers of computing power that one could use over the network and then one would not need to actually invest into own computing infrastructure. You would just send the data and the required operations into the cloud and get back results. You are all familiar with a typical presentation on risk management where we see the same old graph that depicts the risk as finite on one side and the costs of mitigation as infinite on the other side and attempts to show us a balance between the two where the costs are minimal. Well, the idea is correct but guess what? The graph is wrong. The graph is wrong and it gives you a wrong idea of cost distribution which in turn causes you to bias towards more risk. That graph actually makes you and your business less risk-averse. How? 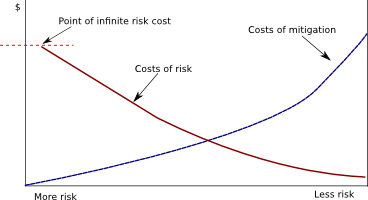 You see, the idea that the risk is finite while the risk mitigation cost is infinite is a myth. 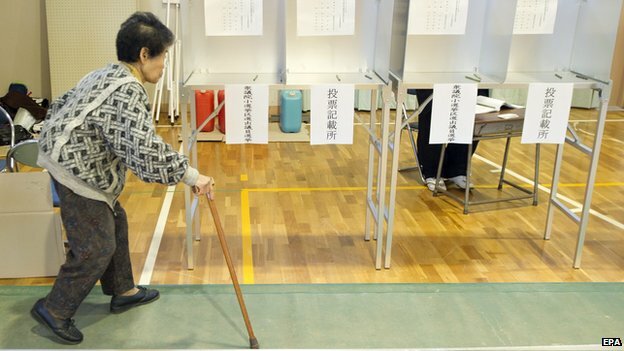 The exit polls at the House of Representatives elections held in Japan on December 14, 2014 indicate that Shinzo Abe’s Liberal Democratic Party is set to “win by a landslide”, according to BBC. In reality, the apathy of the public has won Shinzo Abe a carte blanche to do with the Japanese economy as he wishes. The government said turnout was at just 35%, two hours before polls closed. This election had the worst voter turnout under the current constitution ever. The day after elections all sources quote not the government but the Kyodo news agency that guesstimated the vote turnout at 52.7%. Saves the face of the government, I guess. It would have been hard to cite overwhelming popular support with just one third of the population voting. The election was rigged as an approval referendum for the economic policies of Abe and this point was completely missed by the general public. They probably also missed the point that Abe will be in the office for four years instead of remaining two. WSJ reports that the public was generally confused regarding the purpose of the snap election and no wonder. 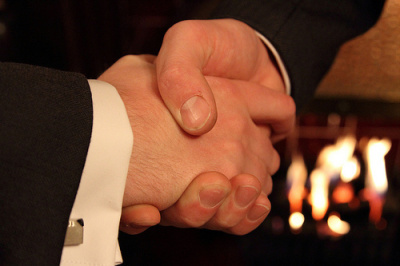 Did you notice a recurring theme in corporate takeovers these years? 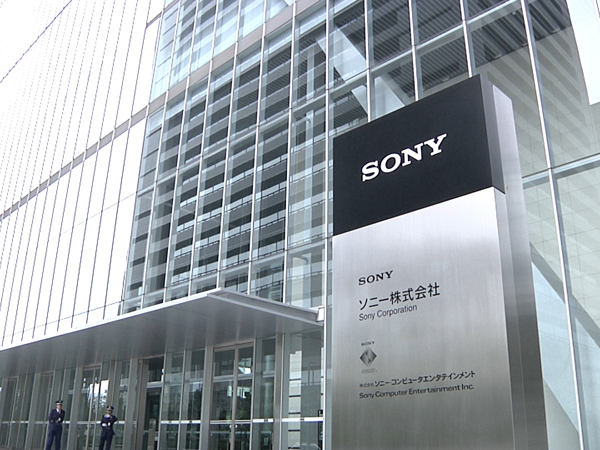 Now we see at Sony Corporation what we saw not so long ago at Nokia. The company received a new top management team that cut all investment into the advanced research and development of new products. The company sells a lot of its assets bringing the value of the company down and the resulting cash is quickly used up. Then, more cuts are executed among product development teams, causing the company to stall and fall behind the competition. The company then suffers a few bad publicity events, causing the share price to drop and leaving the company strapped for cash in the wake of damage compensation payouts. The company is up for grabs and we finally learn who planned and executed the hostile takeover. The scenario worked well on the mobile phones icon Nokia and may soon play out on the consumer electronics icon Sony. The recent years saw the quick raise of the so-called “Personal Relationship Power” into prominence to the point where some people preach that it is the only thing that matters. I heard some American and Japanese colleagues actually teach the young and hopeful managers that the personal relationships are the only thing that works and that any manager worth his salt will be able to do whatever he needs with just that – the power of personal relationships – without the need to rely on position power. As is often the case, this is not entirely untrue, so it sounds believable. On the other hand, it is not entirely true either, so it sounds suspicious if you stop to think about it. What is the deal here? The statement contains part truth and part lie, so in essence, it is false in its entirety but it contains enough truth in it to sound true. Seeing pointless abuse, injustice and absurdity, do not rush to explain it with stupidity; first try to to explain it with vile shrewdness. Japan is officially in recession after seeing its economy shrink for the second consecutive quarter. This comes as no surprise at all when you check what the economy is based on, how it develops and what the infamous Abe did to it. I, for one, am happy to see it work this way, seeing the Japanese economy react in obviously bad ways to the dirty manipulations of its government. It would have been much worse if the so-called “growth” continued yet for a longer while and then would come crashing hard. People suffer first, so this gentle decline is much better than a hard landing for the Japanese economy. But, again, what is happening? Sometimes it is just hard to believe news. 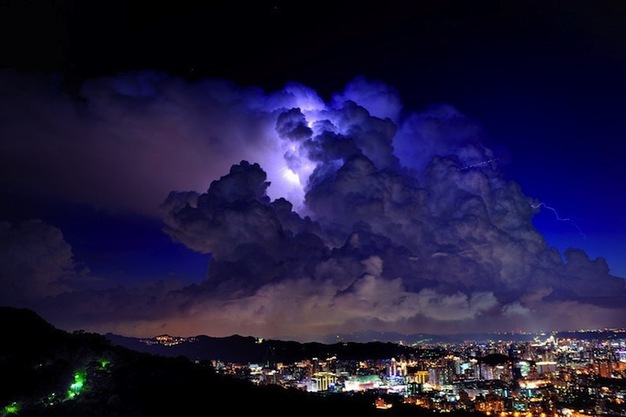 Reuters reports that the Japanese government seriously blames the weather for the failing economy. To this, the only response I have is “you must be joking”. But, no, they are serious. The Economics Minister Akira Amari announced that “heavy rain has probably pushed the GDP down by 1.6 percentage points on an annualised basis in July-September“. 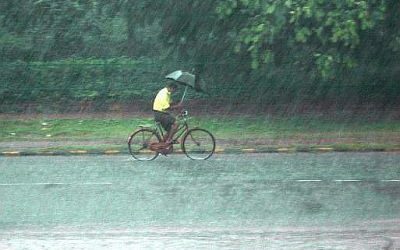 What kind of economy is it that can lose 1.6% because of rain? Mind you, the rain happens every year in Japan, it’s sub-tropical. Anyway, this only looks like a feeble “it’s not my fault” outcry from a naughty child. Instead of accepting the fact that the “abenomics” is destroying the economy and causing the country to fail, it is, of course, much easier to blame the weather for the absence of the much touted economic growth due to the so-called “stimulation”. Japan is an amazing country. Having lived there for a few years I learned a little about people and their beliefs, the way they do things. Japanese are a smart and enterprising bunch of people. Japan has built a perfectly stable economy within an incredibly stable society that is healthy in all possible ways and could be used as a textbook example of how to do things right. It pains me to watch this great country being destroyed now. The last two years are playing out as a really bad disaster movie or a nightmare that is impossible to wake up from. I feel my heart tearing apart every time I read the news about more economic atrocities from Shinzo Abe and his minions. Why do I say Japanese economy is perfect? While the world is watching the civil war in Ukraine the European economics is sliding into oblivion. The Manufacturing PMI tells a story that should scare the hell out of the politicians of EU – so bad the business dynamics in manufacturing looks. In August, out of 26 countries, only 9 reported improvement in the index, 15 recorded a slowdown in the two countries has not changed. 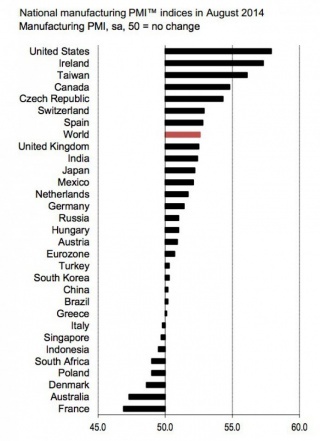 In fairness it should be noted that 21 countries report PMI is still above the level of 50 points, and below only 5. But it is not so important, because the dynamics is still downward. There are those who are moving in the right direction: in Greece and Turkey business activity index in August was able to finally overcome the mark of 50 points. The rest of Europe presents a serious reason for concern, whether peripheral or central: everywhere there are signs of a serious recession.